The moment we saw Jeffrey we knew we had to have him! When I was little I had pugs, and I have been in love with the breed every since! We have our 3 year old pug, Mowgli, and were ready to get another so that he could have a companion, and because we just couldn’t resist having another. I had found the CPR website a while back, and would always find myself looking at the available pups. I know that rescuing was the way that we wanted to go! When we saw Jeffrey and read his story we knew right away he was the one! I immediately filled out the application not knowing what to expect! The next morning Marcia called me. I wasn’t expecting to hear back so quickly, and we were all so excited! Stacey, Jeffrey’s wonderful foster mommy, called us later that day to set up a house meet. Two days later they brought Jeffrey to our house, and were immediately in love! Jeffrey was everything we hoped for, and needless to say he found his permanent home! Mowgli and Jeffrey get along great, and I think Jeffrey is very happy in his new home! Stacey did such an amazing job fostering him, and we almost have him completely potty trained, and he really is such a smart pup! He gets along on his leg better and better everyday. I still have not seen any sign of it bothering him at all! He gives his big brother a run for his money, and always wins tug-o-war! Maybe Mowgli let’s him win, ha…but I don’t think so! Jeffrey is our lil angel and we cannot thank Marcia and Stacey enough. I am so happy that we could be part of this amazing organization. 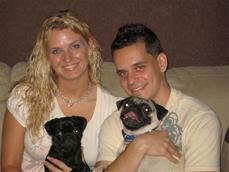 Thank you so much to Pug Rescue for bringing us our lil boy!! A tremendous thank you to Lauren, Diego, & Mowgli for welcoming this slightly disabled, but none the less darling boy, into their home and hearts. Many thanks to Stacey, our west coast amazing volunteer for teaching Jeffrey proper pug manners that stole the hearts of his new mom and dad!